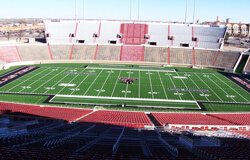 Representing a brand new show and location on the 2007 Summer Music Games Tour, Drum Corps International presents the DCI West Texas major event on Wednesday, Aug. 1, at Texas Tech University's Jones AT&T Stadium in Lubbock. The DCI West Texas event will take place in the final week before the DCI World Championships at Rose Bowl Stadium in Pasadena, Calif. You won't want to miss this exciting lineup of 11 Division I drum corps as they put the finishing touches on their competitive programs before taking the field only one week later in Championship competition. Tickets for this event are now on sale for $23 each. A group ticket rate of $18 also is available to those purchasing 25 tickets or more. Purchase your DCI West Texas tickets now!